You know what I find really sad? When companies keep re-releasing the exact same game on multiple systems. They do this so you can pay them multiple times for the exact same game. Balloon Fight is a perfect example of this. Nintendo released this game on the 8-bit NES, Gameboy Advance, Nintendo 3DS, and now the Wii U. I played Balloon Fight on the 3DS for this review. The constant re-releasing is not the most egregious issue related to Balloon Fight. This game is a copy cat clone of Joust. The main difference is we float on balloons instead of a flying creature. The game play, game design, and concepts are a complete rip-off. Players are given more than one balloon. Enemies will pump up new balloons after they have been knocked to a platform. So we have to go and finish them off quickly. 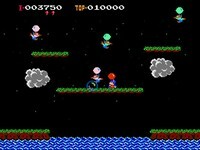 The controls in Balloon Fight drove me crazy. They are loose, frustrating, and annoying. I had more issues trying to go to certain spots in a timely manner. So much so that as soon as I am done with this review I am deleting Balloon Fight off of my Nintendo 3DS. I never want to see this game again, but I am sure Nintendo will port it over to something else in the near future. The music in Balloon Fight is decent. There are a variety of old school things going on graphically as well. The clouds are a nice touch, and add to the game play.